Garlic chives, also known as Chinese chives, or Nira in Japanese, is a green vegetable commonly found in Chinese cuisine, but it is also frequently eaten in Japanese households. It is a rich source of vitamins and minerals, including calcium; and should preferably be eaten within 2 to 3 days after taking home. 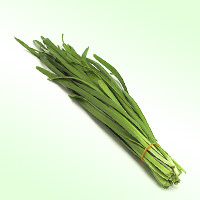 The calories in Garlic Chives per 95g(1bundle) is 20 calories. Garlic Chives is calculated to be 21Cal per 100 grams making 80Cal equivalent to 380.95g with 3.8g of mostly carbohydrates、1.62g of protein、0.29g of fat in 95g while being rich in vitamins and minerals such as Vitamin K and Molybdenum.